What time of day is the best for training horses? Most of the time we choose to train our horses as our schedule allows, first thing on a Saturday morning, just after school on a weekday or in the hour before dinner on a summer night. Others schedule to ride with their coaches once or twice a week, maybe 1:00 on Wednesdays or Tuesday and Thursdays at 4 pm. and they hope to do most of their training under supervised rides. But when is the best time to train? Answer: When the opportunity presents itself. As much as we would like to make the ‘best’ training times fit into our schedules, it is often the worst times that offer the most opportunity. Take this photo for example. This was taken close to midnight after a very long day at the Congress…but it happened to be the best time for training. I say that it was the best ‘time’ because it is the time that Newt, my horse, told me he needed to be trained. Earlier that day we had ridden in the arena but I noticed when I left the arena and walked down this alley, Newt was excited by the activity. What you cannot see in the photo is that to our left (the right side of the photo) there are horses being ridden..and their feet are at Newts eye level. It is a strange angle to view horses from…at least that is what Newt said! When Newt got excited I chose to turn him back and ride up and down the alley until he calmed down. I even took him up into the arena for a little work. He ended up walking back to the stalls fine…but it left a lingering question in my mind. Did Newt really get over it? So here I am, four hours later, double checking. I knew I wouldn’t sleep well without knowing the answer and I was hauling out of the show the next morning and would lose the opportunity to be in the same situation again. 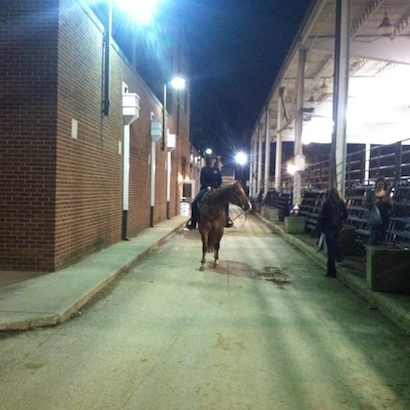 So I saddled up, just before midnight, to do some final training. Turns out everything was fine. Newt walked quietly and the entire ride took only a few minutes…but if it had taken all night I would have been find with that too. The best time to train a horse is when the opportunity presents itself and I’m not one to skip that opportunity. 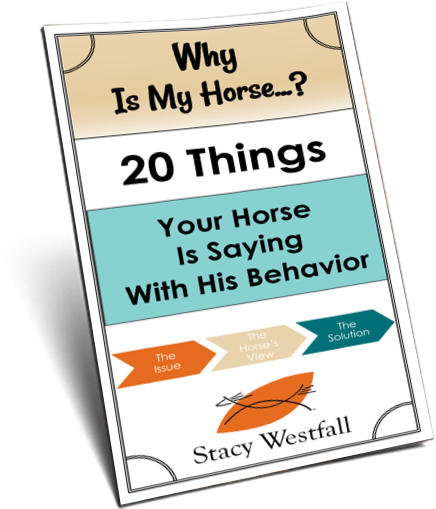 ← What stall toys do your horses have? You have made me feel much better about training horses at midnight. Thank you. 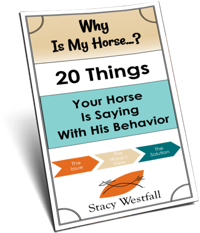 We say whenever you are with your horse you are training them! I completely agree with you Stacy; however, I find that training after work at my horses dinner time to be a challenge. For one, they are hungry and I have a hard time making them wait to eat, or pulling them away from their dinner. Also, they are crankier, and I understand that. I’m cranky too when I’m hungry and want to eat. So, although this is the only time during the week I can ride, I try to get their focus, do the lesson/ride and get them back to their food. Ha ha very true although my wife gets a tad cranky if I tell her I need to go for a ride at midnight lol.